Its common knowledge that plants require good soil aeration, nutrition and water to thrive. However If your garden soil is lacking in any or all of these arenas, there’s something that you can add to improve the soil structure and its called Vermiculite! But what is vermiculite and how is using vermiculite as a growing medium beneficial to the soil? 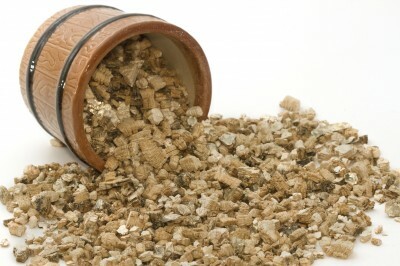 Vermiculite can be found in potting soil or can be bought in bags from us for gardening. We can supply in various sizes depending on your application but this is our largest size and is ideal for improved soil aeration. Vermiculite is the name of a group of hydrated laminar minerals (aluminium-iron magnesium silicates) which look like mica. Horticultural vermiculite is processed with massive heat that expands it into accordion shaped pellets composed of multiple layers of thin plates. It will not rot, deteriorate, or mould and is enduring, odourless, non-toxic and sterile. Vermiculite is generally a neutral 7.0 but is dependent upon the source from around the globe and its reaction is alkaline. It is very lightweight and mixes easily with other mediums. Vermiculite added to the garden or vermiculite in potting soil increases water and nutrient retention and aerates the soil, resulting in healthier, more robust plants. Add vermiculite to soil for conditioning and lightening either alone or in conjunction with peat or compost. This will accelerate the growth and promote anchorage for tender young root systems. Using vermiculite as growing medium will also enable the plant to more easily absorb the ammonium, potassium, calcium and magnesium necessary for vigorous growth. Medium grade vermiculite can be used directly for root cuttings. Just water thoroughly and insert the cutting up to the node. Use vermiculite alone or mixed with soil or peat for seed germination. This will allow seeds to germinate more rapidly. If vermiculite is used without soil, feed the seedlings a weak fertiliser solution (1 tablespoon of soluble fertiliser per 1 gallon of water) once the first leaves appear. Damping off is thwarted since vermiculite is sterile and the seedlings are easily removed without damage to the roots. Vermiculite mixed half and half with soil, peat or compost eliminates packed down soil in flower pots and houseplant containers while allowing excellent aeration, reducing watering frequency and allowing root spread. To transplant using vermiculite, dig a hole 6 inches larger than the plants roots. Fill in with a mix of vermiculite and the removed topsoil. Again, this allows for root spread, provides moisture control and protects the roots from drying out due to sun or wind. Three inches of vermiculite can also be used as mulch around shrubs and other garden plants like roses, dahlias, tomatoes. Place bulbs or root crops in a container and pour the vermiculite around them. The sponge-like quality of the vermiculite will absorb any excess moisture and prevent rot or mildew while protecting them from temperature fluxes. Even newly seeded lawns can benefit from an application of vermiculite. Mix 3 cubic feet of vermiculite per 100 square feet, seed, then cover the entire area with ¼ inch of vermiculite. Water in with a fine spray. The vermiculite will hasten germination and increase the number of seeds that germinate while maintaining moisture and protecting from drying and heat. Lastly, vermiculite can be used when arranging flowers. Fill the container with vermiculite, thoroughly saturate with water, pour off the excess and arrange the flowers. This eliminates the need to change the water, eliminates spills and keeps blooms fresh for day. Just be sure to use horticultural vermiculite and not that sold for house insulation — it is treated to repel water! Call Indigo now on 01268 768 768 and buy Vermiculite direct from us today!